1/17/2019 – Connecticut – The Connecticut Coalition to End Homelessness (CCEH) is asking individuals across the state to volunteer for the upcoming annual counts of individuals experiencing homelessness in Connecticut. The Point-in-Time Count will take place on the evening of January 22, 2019 into the morning of January 23, 2019. The Youth Outreach & Count will take place from January 23 through January 29, 2019. Each year, the Point-in-Time (PIT) Count surveys adults and families with children on one-night and is followed by the Youth Outreach & Count, a week-long count of youth. The separate census for youth is critical as many are missed during the PIT Count because they often do not access adult emergency shelters or other homeless services. For those experiencing homelessness, these Counts offer a chance for them to connect with volunteer surveyors who can record their needs, add them to community registries for housing resources, and guide them towards services and supports that that can end their homelessness. These counts provide two sources of data that are used to measure the extent of homelessness in the state and enables a comparison of how homelessness is trending from year-to-year. Like all states and communities, Connecticut is also required to report this data to the U.S. Department of Housing and Urban Development, who use it to compile the Annual Assessment of Homelessness Report to Congress. The 2018 PIT Count estimated that 3,383 people in Connecticut were experiencing homelessness, 683 of them children. The 2018 Youth Outreach & Count estimated that 5,054 youth under age 25 reported being homeless or unstably housed. The full 2018 PIT and Youth Count Report can be found at www.cceh.org/pit/data-and-reports. Connecticut has been a national leader in ending homelessness, having reduced the number of people experiencing homelessness by 25 percent since 2007. Connecticut is one of three states that has been recognized for effectively ending homelessness among veterans, and is currently working to end homelessness among families, youth, and children by 2020. The success of these Counts depend on the participation of volunteers. 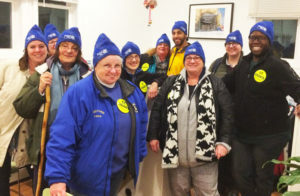 Volunteers are trained to administer the survey, learn about community resources, and will hit the streets as a part of a survey team led by a member of Connecticut’s homeless service-provider community. Visit www.cceh.org to sign-up to volunteer. Volunteer surveyors will be using a mobile app called “Counting Us”, developed by Canton, MA based company, Simtech Solutions. The 2019 PIT Count and Youth Outreach & Count are made possible through generous support from the Department of Housing, Department of Mental Health and Addiction Services, Fairfield County’s Community Foundation, Farmington Bank Community Foundation, Hartford Foundation for Public Giving, and Melville Charitable Trust.